Former Maryland governor and 2016 Democratic presidential candidate Martin O'Malley said Tuesday that he was keeping an "open mind" about another presidential run and that he thinks gun control is a winning issue for Democrats up and down the ballot in 2020. O'Malley addressed a crowd of business leaders at the "Politics & Eggs" series hosted by the New Hampshire Institute of Politics at St. Anselm College. 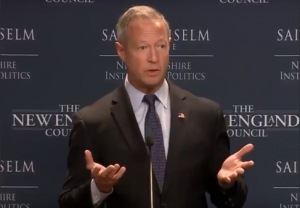 In his remarks, O'Malley laid out an optimistic vision for America's future that was premised on embracing young voters to achieve progressive victories on immigration, gun control, and a bevy of other topics, according to the New Hampshire Journal. O'Malley opened up his address by making light of his failed presidential campaign, saying his return to New Hampshire was "a triumph of hope over cruel experience." O'Malley also poked fun at former Secretary of State Hillary Clinton and Sen. Bernie Sanders (I., Vt.), his competitors for the Democratic nomination two years ago. "History will prove that I was the only life-long Democrat who ran for president in 2016," O'Malley said. Clinton and Sanders weren't the only ones subject to O'Malley's acerbic wit. While the governor spent a significant portion of his speech praising youth voters, the phrasing and tone betrayed his disdain for President Donald Trump and the Republican Party. "If you want to know where a country is headed, talk to its young people," O'Malley said. "You will rarely find among them people that deny climate change is real … You will rarely find people who bash new American immigrants or want to deny rights to gay couples or their kids." O'Malley's most pointed rebuke came on the topic of what he called "combat assault weapons." "[Young people don't] think it's a great idea that people be able to buy combat assault weapons without background checks in the United States of America," he said. "The only developed nation on the planet that allows that." The firearms O'Malley referred to as "combat assault weapons" are described by the National Rifle Association as "45 specific types of commonly owned semiautomatic firearms." Throughout his remarks, O'Malley reverted back to the topic of gun control, at one point even agreeing that it was a winning issue for Democrats across the board. O'Malley, sounding very much like a presidential candidate, also said it was time for the Democratic Party to shake itself "out of the pity party" mentality that has taken hold. He suggested Democrats seize the opportunity presented by Trump, who he called "the most effective tool for candidate recruitment" available, and push for Democrats up and down the ballot. "We have to hold out and cast away the fear of the future that has become the stale currency of our current politics, and instead embrace it, not be afraid of the light that shines within us," O'Malley said. "Look into the eyes of our kids and call forward that goodness." "I have no doubt that our country is going to come through this temporary time and when we do we're going to be better for it," he added. After the event, O'Malley confirmed to NBC News that he was weighing another run for the presidency in 2020. "[I'm] keeping an open heart and an open mind about running again," he said. O'Malley's 2016 campaign never made headway after attempting to walk a tightrope between establishment Democrats, who made up Clinton's base, and progressives, who flocked to Sanders' insurgency campaign. O'Malley dropped out of the race after coming in third in the Iowa Caucuses with only 0.6 percent of the pledged delegates. The Maryland Democrat, also a former mayor of Baltimore, has a long history of supporting gun control measures. As governor in 2013, O'Malley championed legislation that expanded the list of weapons banned for sale in Maryland. The legislation also limited handgun magazines to 10 rounds and required individuals applying for a gun license be fingerprinted as part of the application process.